We are in the midst of summer here in New Jersey, and beautiful fresh fruits are abundant. My favorite time of the year. Yesterday, I made a lovely batch of Spicy Blackberry Jam. The blackberries freshly picked from my garden. My garden has been serving up some gorgeous berries this year, and plenty of them. The farmer's markets in my area are full of spectacular fruit, and that worked out just perfect for me this week. Perfect for a summer day! 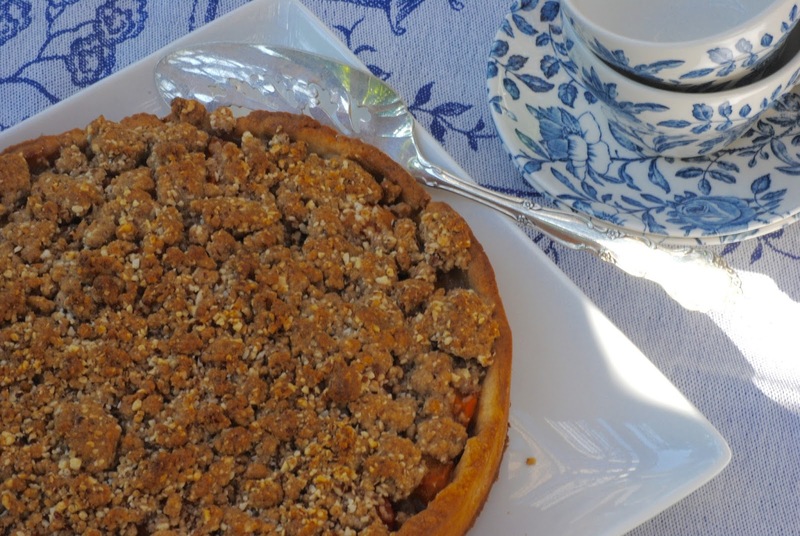 Our Cook the Book Fridays group, has picked David Lebovitz' Apricot Crumble Tart. I have been looking forward to making this tart since I first saw it, months ago. It did not disappoint! Leave it to the French to celebrate the sublime tartness of this lovely fruit, with an incredible buttery almond crumb topping. This tart has very little sugar added to the apricots (only three tablespoons). The crust was easy to put together and then pressed into the springform pan. Mine was perfectly thick and cookie like and didn't crumble when plated. 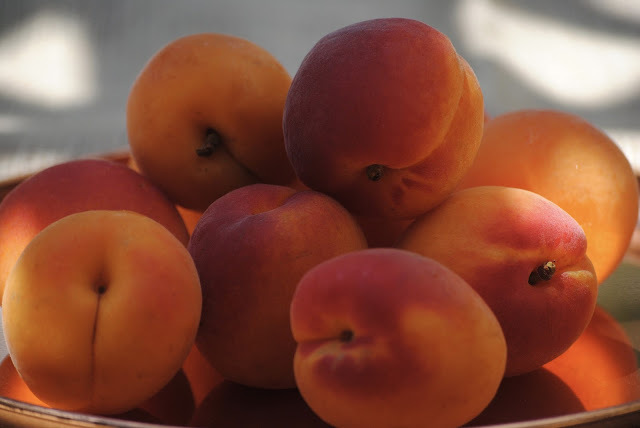 The apricots were also easy to prepare, take out the pits, cut them in quarters, and mix with sugar, cornstarch, and extracts. Be sure to save the pits for David's Almond Kernel ice cream, (which I wasn’t able to get done for this post). This tart is delightfully delicious, however, Bill is still watching his weight. I just couldn't leave this tempting treat sitting around as he grazed the kitchen for snacks. So yesterday, after my walk with neighbors, I invited them over for coffee, tea and Apricot Crumble Tart on my back deck. The weather was perfect, as was the company. And the tart was enjoyed by all!! This post participates with Cook the Book Fridays. We are a virtual cooking group making our way through David Lebovitz's beautiful new cookbook, "My Paris Kitchen". To see what the other bloggers thought of this tart, check out their links here. This recipe has been shared on-line and is posted here. 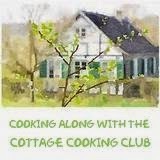 If you're interested in cooking along, we would love to have you. Pick up a copy of David's cookbook, and join the fun. 1. TO MAKE THE DOUGH, remove butter from the refrigerator 10 minutes before using it and to let it soften slightly in the bowl of a stand mixer fitted with the paddle attachment. Add the sugar and beat on medium speed just until no visible lumps of butter remain. Add the egg yolks, flour and salt. Mix until the dough comes together. (You can also make the dough in a bowl using a spatula and a little moxie.) I used my food processor for the dough. It came out perfect. 4. 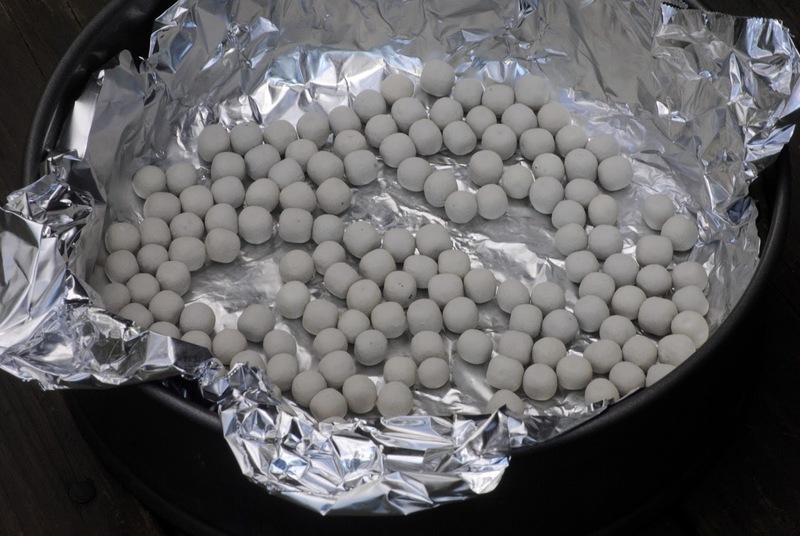 Preheat the oven to 375ºF (190ºC). 5. Line the springform pan with aluminum foil and a single layer of pie weights. Bake for 20 minutes. Remove the foil and pie weights and bake for another 5 to 10 minutes, until the tart shell is browned. 6. After the tart shell comes out of the oven, make the filling. In a bowl, mix the fruit with the sugar, cornstarch, and vanilla. Do not make the filling too far in advance because the fruit may become too juicy. 7. Transfer the fruit to the tart shell and even them out. Strew the crumble topping evenly over the fruit. 9. 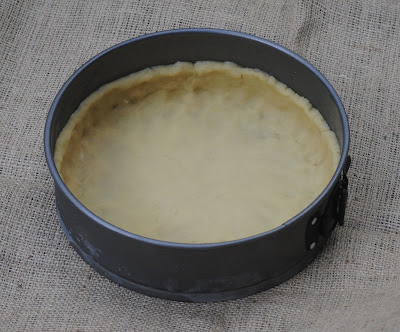 Let cool on a wire rack for a few minutes, then run a knife around the outside of the tart to separate it from pan, in case any juices ran over. Let rest for 30 minutes, then remove the sides of the springform and let the tart cool. The edges may look rather dark, but should taste fine, not burnt. Serve warm or at room temperature with whipped cream or ice cream. He got to eat several slices. I could never be that cruel. 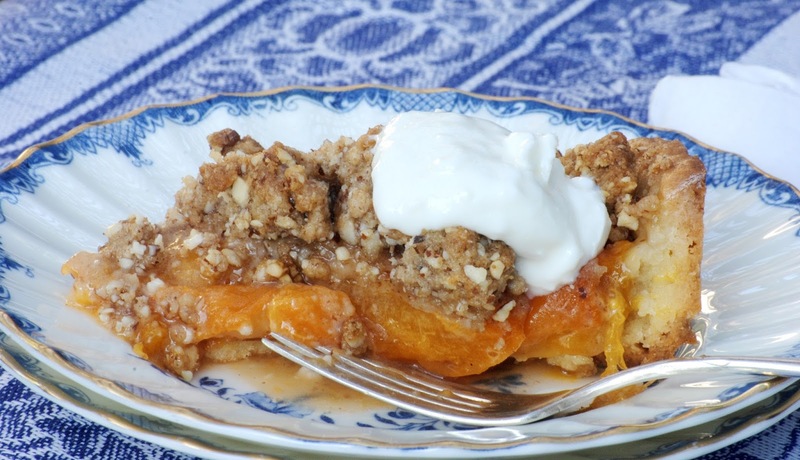 Those apricots are really juicy and sweet..and the streusel topping makes the whole tart even more tempting. with friends? Definitely a repeat recipe. Perfect looking tart, Kathy! Your neighbors were lucky to be able to share this, thought I'll bet Bill was disappointed! I'm glad your garden is doing well. Ours is horrible this summer partly because of the drought. The birds ate the limited raspberry crop, and our blackberries contracted a systemic disease (rust) and had to be removed. I'm coming over to your house! It is one thing to make a delightfully delicious tart. To make it available to be enjoyed by neighbors and family is really special. Good for you! Your tart looks perfect and your photo of the apricots is especially beautiful. Those apricots...just amazingly beautiful and so nice in that gorgeous tart! This is definitely an "invite friends over to share for any old occasion" kind of tart, I think in part because the sugar content is on the lower side. These photos totally evoke summer, Kathy!! Yeah my husband just started watching his weight so I am starting to take extras with me to work. Yours looks great! when a tart turns out this good, how can you NOT share it with the neighbours. It's a great way to make and keep them as friends! BEAUTIFUL!! !And I love the teacups and tablecloth! This looks delicious. I am enjoying baking summer fruit desserts. A lovely tart, wonderful pictures in a beautiful setting! And you got lucky neighbors! This was certainly good, I got great reviews from the person I gifted one of my mini-s! What a lovely looking tart, Kathy, and it so sounds like you to share it with your neighbors. It's also nice of you to not tempt but support Bill. I'm sure he appreciates that. I remember him from Seattle as being tall and thin. What's with the diet business? I enjoyed this tart as much as you and your neighbors. As for the ice cream, I think I will skip that recipe after reading about the cyanide or whatever. Oh, Kathy, this sounds great! And I love that the apricots don't have lots of added sugar. Bet your neighbors loved it! And I'm envious of your blackberry jam, my favorite, and I'm wondering what makes yours spicy. Unfortunately, I haven't seen many blackberries lately. Beautiful tart Kathy! I am struggling with my weight like your husband and have taken to shrinking the size of some desserts (done successfully with your beautiful blueberry cheesecake from a year or two ago) to cope. I may have to try that with this if I can come by the apricots! Your tart is absolutely gorgeous.you have me wishing apricots were still available here.